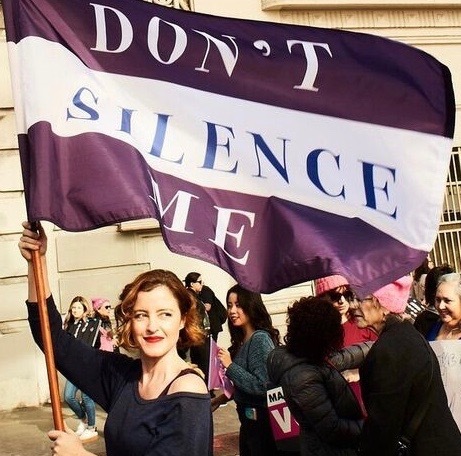 “Don’t Silence Me” is an anthem by UK singer songwriter Sadie Jemmett. Written for her friend, actress Mhairi Morrison, who was sexually assaulted at the beginning of her career in Paris, by an extremely influential film director. Following a successful fundraising campaign, Sadie and Mhairi, together with film maker Jenn Page, are now in the process of editing the music video for the song in the hope that it will inspire a movement of supportive change and dialogue for any woman who has dealt with sexual harassment or survived sexual assault. Over 40 women appear in the video, many of them survivors, including Sarah Ann Masse, Louise Godbold, Lili Bernard, Tasha Dixon and Chantal Cousineau. It’s about shining light into the lonely darkness, releasing oppressive shame, and unleashing our constricted freedom through inner strength, sisterhood and community. Together, we use our empowered voices. Together, we trust again. We heal. We step forward into the light and live with joy. We will be releasing the video March 5th, to coincide with International Women’s Day (March 8th). The week of the release we will have a red carpet premier event along with panel discussion around the topic of Me Too, What’s Next. Details TBD.